The sheeps in the meadow, the cows in the corn. Where is Little Boy Blue who should be tending the sheep? 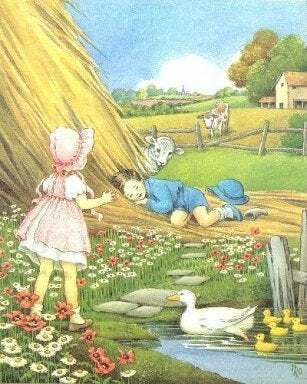 He's under the haystack, with Little Bo Peep. I bet all of you expected me to use Andrew Dice Clays version, right? Well, I'm sorry. Child prostitution is no joke! I may laugh, but it's not funny. I laugh out of anger. If you think about it though, it's not that strange. I mean, people cry with happiness all the time. Or, how about people who fear their loved one was the victim in some horrific accident, and when they find out the person is fine, they get mad and beat them for scaring them. Emotions are weird. And they make us act in strange ways. Like we needed another excuse to act strange. I'm sure all of you have heard the nursery rhyme Little Boy Blue. If your parents didn't recite it to you as a toddler, you most likely heard it in kindergarten. And also probably used it to begin learning how to read. And like so many other popular nursery rhymes, it's old. Very old, in fact. And, it's actually based on a real person. That person was a butchers son named Thomas Wolsey, who grew up in Ipswich England. Tom, (I can call him Tom, because he's been dead for centuries, and therefore, can't stop me. ), was a very energetic and confidant man. That energy and confidence carried him to Oxford University, where he earned a degree in divinity. Always a bold go-getter, Tom wormed his way into the good graces of the young king, Henry VIII, in 1515. Soon, he was acting as the personal clergy to the king. And much more. Henry was a young man, and he liked to have fun. For Henry, fun was wine, women and food. Tom was power hungry. So, he persuaded Henry to transfer more and more of the daily tasks of running the kingdom to him. This left more time for fun for the king. Tom used his power as cardinal and de-facto ruler of England to do what he wanted. And one of the thing he wanted was money. By 1529, only the king was wealthier than Tom. But Tom also had another desire. And it's the desire most people have. Even though he was a catholic clergyman, sworn to chastity, he was the father of at least two children. Henry decided he wanted to marry Anne Boleyn. The problem was, Henry was already married to Catherine of Aragon. And, being catholic, divorce wasn't permitted. So Henry went to his faithful clergyman, Tom. Henry asked Tom to persuade Pope Clement VII to grant an annulment from his marriage to Catherine. In his defense, Tom tried. But the pope would have none of it. Despite Toms pleas, the pope would not grant Henry his annulment. Upon hearing the news, Henry went ballistic. He charged Tom with praemunire. He confiscated all of Toms wealth and stripped him of his power. Then Henry banned catholicism and founded the Church of England, making himself the head of the church. First oder of business? Granting himself an annulment. Tom died in 1530 while awaiting trial on charges of treason. As a boy, Tom tended to his fathers sheep. His fall from power are represented by Little Boy Blues disappearance and inability to blow his horn. Bet you didn't know you were being taught history as a toddler, did you? Praemunire, (pronounced pre-meuh-nye-re), was a law that prevented anything or anyone from having more power than the reigning monarch. Challenge yourself and use that word at least 5 times today when talking to friends/family/coworkers/strangers on the bus.